Relive the “Awesome” adventures of Mega Man!! Nintendo reveals Super NES mini console!! 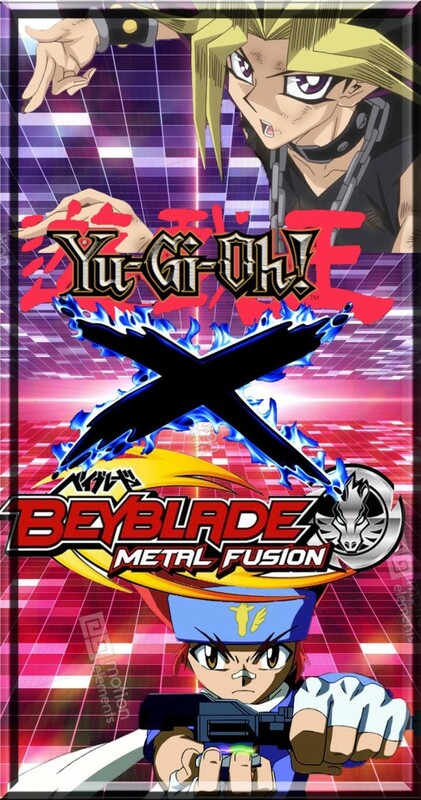 Yu-Gi-Oh X Beyblade Chapter 6 Pt.4!! Osiris throws his head and laughs. “Well Pharaoh, we meet again. Now we can get this battle underway,” he says. Osiris snaps his fingers. A hole then opens up in the ground next to the Beyblade stadium and an object rises from it. Gingka, Benkei, Yu and Kenta look at the strange table. The design resembles a pharaoh’s sarcophagus, lavishly styled with jewels and intricate decorations. On the table sat five cards on either side and above them are five empty spaces the same size as the cards. “Uh, what’s with the card table?” Yu asked curiously. “You got me,” replied Kenta. Gingka asks Yami Yugi about the table. “It’s something from my world,” he answers plainly. “Duel Monsters? Oh, you mean that game you play in your world that Yugi told us about?” said Madoka. She had told Jonouchi, Honda and Anzu about her world, Beyblade and the battles they have. She even used her minicomputer to show them various types of beyblades including Gingka, Kenta, Benkei and Yu. “Yugi told you about that, huh?” Anzu said. Madoka answers Anzu with a nod. “He told us about you as well. All he can think about was finding you three and getting back to your world. Yugi was so sincere that we had to help him,” she tells Anzu, Jonouchi and Honda. “Well, I’m glad Yugi was able to find such nice people here,” Anzu said kindly. “So am I. Thanks for helping our pal out,” Jonouchi said with his usual bluster. “We’re not out of the frying pan just yet. Yugi and your friends still have to beat this Osiris guy and get us out of here,” Honda said to Madoka. Honda is known for his cynicism. He has a tendency to look at the dark cloud before seeing the silver lining which annoys Anzu and Jonouchi. “What kinda talk is dat, Honda? !” Jonouchi barked loudly, grabbing Honda by his jacket. “Hey, lay off, Katsuya! I was just saying, so chill out!” Honda snapped back, also gripping Jonouchi by his jacket. Whenever Jonouchi and Honda get riled up and make fools of themselves, Anzu always ends up playing the mediator. “Will you two both cool it? !” she snapped at them. She then looks back at Madoka. “Sorry, they can be such idiots,” she says. Madoka laughs and says, “It’s fine. I know the feeling. There’s a couple I gotta deal with from time to time.” For a moment, she recalls the few times Gingka and Masamune have butted heads, especially when the situation doesn’t call for it. Madoka seems to be the one to calm them down, just as Anzu did now with Jonouchi and Honda. However, Gingka and Masamune do help each other and are still friends in the end. If anything, they fight and argue like brothers which why Madoka can’t stay mad at them for long. “Hey Madoka, you said Gingka is game champion like my pal Yugi, right?” Jonouchi said. “Yeah, Jonouchi’s right. All of our friends working together will be able to taken down Osiris and his creeps,” said Anzu. “You’re right. We just gotta believe in them,” Madoka says. During their inspiring conversation, Honda gets everyone’s attention. “Hey, if you guys are done, it looks like the duel, er, battle or whatever is about to start,” he tells them. “C’mon, Madoka. Let’s watch our pals wipe the floor with these bozos,” Jonouchi said with zeal. Madoka smiles brightly. “Yeah,” she says. Yami Yugi gazes at the Duel Table that had just risen from the ground wondering what purpose it serves. Gingka and the others wondered the same thing. “Yugi, you said this table is something from your world. What is it exactly?” asks Gingka. “It’s a Duel Table. We use it to play Duel Monsters. But why would Osiris have brought this here?” said Yami Yugi. Yami doesn’t respond. He just gazes at the man who has been nothing short of respectful since their encounter in the park, trying to figure him out. Azeem is very calm yet he radiates with an intensity that puts Yami in unsteady state. Almost like Shadi, who has made trouble for Yugi and his friends on several occasions. He is the bearer of the Millennium Key and Millennium Scales which he used to judge those worthy of wielding the Millennium Items. Shadi was never clear on his true intensions. Yami could never figure him out. He feels the same about Azeem. He’ll have to be extra careful. Looking down at the cards before him, Yami begins to recall Osiris’ information about them with Yugi’s help. Yami picks up a card and places it in one of the numbered spaces. Azeem scans his cards carefully. He hovers a hand over them. After some deliberation, he makes his selection. Benkei, Kenta, Yu and Gingka watch with curiosity as Yugi selects another card. “What’s the deal with this card game anyway?” Benkei asked. “What’s that supposed to mean? !” Benkei said with intensity. “Get a clue. This isn’t a game. The Pharaoh and Azeem are selecting who fights who in this tournament. Each of those cards represents a member of each team,” she tells them. “Yeah, yeah, we heard. And with the cards facedown, we won’t know who’s battling in what round until they’re turned over,” Yu interrupted, matching the girl’s impetuous attitude. “Aww, that’s so cute. I didn’t think a kid like you can be so smart,” the girl in silver garb mocked. “Hey! Who are you calling a kid? !” Yu snapped. If there is anything he doesn’t like, being called a kid is at the top of his list. “Whatever you say…kid,” the girl in silver said with smile and a wink. Yu was about the lash out again until he is held back by Kenta. “That’s quite enough, Ferrah,” said the taller woman in the dark outfit with a firm tone. “Aw, I was just having a little fun, Neferiah,” said Ferrah. “I know, sister. But please save it for the battle ahead of us,” Neferiah tells her. “Okay, okay,” replied Ferrah with a huff. Neferiah, the taller sister, looks over at Yu with a sharp gaze. “You should do the same as well, Yu Tendo,” she says with a hollow tone. With that, she stoically turns away from him. Yu gnashes his teeth. No one calls him a kid. He hopes to battle the smaller sister and make her pay for insulting him. Yami places another card face down in an empty space. Now just two cards remain. He mills over which one he should choose, however, at this point it wouldn’t matter. Since the cards cannot be revealed until the final selections are made, he cannot be sure if he made the right choices. All he can do is hope that he did. Yami takes the card furthest to his right and places it in the number 4 space. Azeem doesn’t hesitate in selecting a card. With one space remaining, Yami makes his last move. Azeem follows. (Check out my first novel Defenders!! CLICK HERE! !